Overview - The comedy follows a sheltered young woman (Julianne Hough) who loses her faith after a plane crash and decides to go to Las Vegas to experience the wild side of life. On her journey, she meets unlikely companions (Russell Brand and Octavia Spencer) who inadvertently help her find her true self. Though I've never quite understood all the backlash, Diablo Cody is admittedly an easy filmmaker to hate. Marked by idiosyncratic slang and quirky character names, her scripts can have a habit of causing more annoyance than entertainment. And then there are all her constant pop culture references, quasi-provocative observations, desperate attempts to seem hip and relevant without being "mainstream," and -- wait a sec, where was I going with this again? Oh, right. While Cody might be an easy target for disdain, her work still demonstrates genuine talent, and though it's certainly divisive, she has a sharp voice all her own. With her latest effort, 'Paradise,' the Oscar winning writer known for her edgy wit takes on directing duties for the very first time, and the results are… uh, actually kind of sweet. Hell, they're damn near schmaltzy. Despite a potentially inflammatory opening act, the film becomes a rather harmless, simplistic, syrupy, and ultimately forgetful debut that, for better or worse, somehow lacks many of Cody's usual trademark quirks. I know, shocking, right? After surviving a terrible plane crash with severe burns all over her body, a disillusioned small town girl, Lamb (Julianne Hough), decides to denounce God and leave her insulated religious community behind. Wishing to experience all the "worldly pleasures" she's missed out on, Lamb heads for Las Vegas, Nevada. There, she befriends a lounge singer (Octavia Spencer) and a bartender (Russell Brand) who both help her navigate the exhilarating yet dangerous world of Sin City. But as Lamb struggles to adjust to her newfound surroundings and precarious physical condition, she begins to question if a party lifestyle is really any more fulfilling than her previously devout and sheltered existence. Initially, Cody sets up a rather provocative premise and the opening sequence in Lamb's church will definitely rub some religious viewers the wrong way. With that said, this early lean toward controversy is quickly tossed aside, and in a fairly perplexing turn of events, most of the bite and edge that Cody is usually known for is swapped out in favor of old fashioned sentiment. Well, OK, maybe old fashioned isn't the right word, and there's still a certain spark of subversion here, but it's nowhere near as caustic as one might expect. Sadly, it's also nowhere near as interesting. Instead, "cutesy irreverence" might be the best word to describe what follows -- though, the emphasis is much more on the cutesy part. We focus on Lamb as she traverses the corrupt Vegas landscape and learns obvious life lessons from her helpful guides, and while we do get a generous helping of Cody's unique, funny dialogue, much of the plot is sadly by-the-numbers and disappointingly simplistic. The story's themes dealing with acceptance, faith, kindness, friendship, and finding one's place in the world, are all well-meaning (and unexpectedly benign) enough, but Cody's execution and characterizations end up being generic and underdeveloped. Stylistically, the whole affair is pretty typical as well, though there are a few flourishes here and there, including a playful onscreen "sin counter" that tallies all of Lamb's indiscretions. An occasional voice over narration from the protagonist doesn't work nearly as well, however, and often feels a little superfluous. Though Cody's overall direction is certainly capable, it lacks the identifiable voice that's often found in her writing. Still, that love it or hate it voice does manage to shine through the characters from time to time, and thankfully the cast members make the most out of their thinly written roles, creating an enjoyable ensemble of "broken weirdos." I haven't seen dancer/singer turned actress Julianne Hough in any other films, but her turn here is actually pretty strong. She perfectly exudes Lamb's mixture of naïve innocence and disenchanted cynicism, creating a character that is both perky and a bit prickly. She's an eager fish-out-of-water filled with enthusiasm and shock for everything she sees, and Hough nails her wide-eyed vulnerability and growing inner strength. Octavia Spencer is also likeable in a mostly clichéd part (a fact that even Cody admits in one of the script's self-referential jokes), and Russell Brand gives a comparatively restrained yet heartfelt version of his usual shtick that works quite well. Of course, the real highlight here is Ron Swanson himself, Nick Offerman. Though he is painfully underused, the sheer fact that he shows up in a nearly unrecognizable cameo as Lamb's balding, mustacheless father is almost worth the price of admission alone. 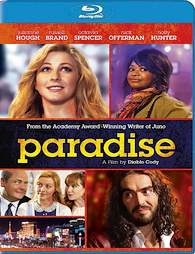 Despite being the first script that she's actually directed herself, 'Paradise' somehow feels a lot less like a Diablo Cody movie than any of her previous writing only efforts. Sure, the end results are faintly amusing, heartfelt, and humorous, but the flick could have used a lot more personality and bite -- two things that Cody is usually known for. I'm not saying that a movie has to be provocative to be good, but as its edge dwindles, the film also loses any real semblance of narrative originality. At its best, the movie starts to feel like a twisted fairy tale, but this satirical whimsy ultimately becomes far too restrained and sugary. As it stands, it's very unlikely that anyone will really be offended by Cody's directorial debut, but it's also very unlikely that anyone will even remember seeing it the next day. Image Entertainment brings 'Paradise' to Blu-ray on a single BD-25 disc housed in a keepcase. After some skippable trailers, the screen transitions to a standard menu. The packaging indicates that the release is Region A compatible. The film is presented in a 1080p AVC/MPEG-4 transfer in the 1.85:1 aspect ratio. Bright, colorful, and highly detailed, this is a very impressive video presentation. The source is clean and glossy with no major signs of noise or artifacting. With that said, there is some very marginal banding visible during a few fading transitions. The picture features great detail and pleasing dimension throughout, and the opening shot, which focuses on Hough's character emerging from a sparkling ocean is especially striking with life-like depth and razor sharp focus. The color palette plays up the movie' quirky, slightly subversive fairy tale tone, offering a cheery and vibrant look that emphasizes the glittering lights of Las Vegas (a red sequins dress worn by Octavia Spencer is also particularly flashy). Contrast is high without becoming overexposed, and black levels are deep while still offering good shadow delineation. With strong detail, dimension, and lively pop, 'Paradise' comes to Blu-ray in style. There is some very minor banding visible during a few transitions, but otherwise this is a pretty flawless image. The movie is provided with an English DTS-HD MA 5.1 track. Optional English SDH and Spanish subtitles are also included. Spacious and enveloping without becoming too gimmicky or generic this is a well produced mix. Dialogue is clear and nicely balanced throughout, making it easy to hear all of Cody's trademark quips and pop culture references. The cheery music is spread well with strong range and separation, bolstering the film's irreverent fairy tale tone. Likewise, effects work is smooth with solid surround use, creating a convincing Vegas atmosphere full of slot machines and rowdy clubs (with decent bass activity). Other environments offer similarly convincing ambiance and specific effects like planes and passing cars organically shift from the left and right or front and back. For a modest comedy, this mix does a very nice job of naturally immersing the audience in the characters' world. It's just the right amount of lively without being too aggressive or unbalanced, or too subtle and restrained. Commentary with Writer/Director Diablo Cody - Cody offers a decent but mostly uneventful solo track. She shares some production trivia, detailing various shooting difficulties while pointing out locations and deleted material. She also addresses the challenges of directing for the first time while simultaneously being pregnant. Though there are some solid insights, Cody spends a bit too much time simply elaborating on the events on screen and there are some gaps in the discussion here and there. Behind the Scenes With (HD) - Separate interviews with Diablo Cody (5 min), Russell Brand (3 min), Julianne Hough (3 min), and Octavia Spencer (5 min) are provided in 1080p with DTS-HD MA 2.0 sound. The participants discuss the movie's themes, story, characters, and overall message, but there's nothing too interesting here. Theatrical Trailer (HD, 2 min) - The film's trailer is included in 1080p and DTS-HD MA 5.1. 'Paradise' is a surprisingly sugary, by-the-numbers directorial debut from the usually witty and subversive Diablo Cody. Though the flick starts out with some provocative satire lobbied against religion, the runtime gradually loses its edge and becomes rather sweet but dull. The video transfer is fantastic, however, with a bright, colorful picture. Likewise, the audio mix is strong too, offering a well produced and immersive mix. The supplements aren't as impressive, but there are a few decent insights peppered throughout the interviews and commentary. This is a solid disc for a mediocre flick, but the cast is likeable and Cody's humor is worthwhile enough to warrant a rental.